If you’re planning for a spring break trip, your mind is probably focused on relaxation, warm temperatures, and soaking up the sun’s rays. While spring break may seem like it’s only reserved for college students, you definitely don’t need an excuse to plan a fun getaway to your favorite tropical paradise. This is a wonderful time of year to escape the cold and take advantage of awesome travel deals while making fun memories with family and friends. If you’re planning to jet off to the beach, here are some tips on what to pack. Of course, you’re going to need your favorite warm weather clothes. Check the weather forecast of your destination and be sure to plan and pack accordingly. Even if the weather is forecasted to be warm and sunny, it’s always a good idea to pack a light jacket and pants. You should also pack a rain jacket too, in case of fast-moving or unexpected weather. Comfortable walking shoes or sandals will come in handy, especially if you plan to get out and enjoy the scenery. Obviously, bringing your favorite swimsuits and sandals is essential to an island trip, so be sure you don’t forget those! Want to get the most out of your trip? It may sound counterintuitive, but planning your vacation ahead of time will allow you to relax when you get there. Do you want to enjoy a few days on the beach and then go on an exploration hike? Choose which trails you’d like before you leave so you won’t spend your beach time studying a map. Are you interested in taking a sunset boat ride? Go ahead and book it now, since they tend to fill up quickly and you might miss out. With an expertly planned out timeline, you’ll arrive at your destination ready to relax with a perfect itinerary. Enjoying the warmer weather will mean that you’ll be outside for long hours, so sunscreen is vital to preventing sunburn and sun damage. Don’t settle for just any sunscreen though. Hawaii and Key West, Florida just banned sunscreens that contain oxybenzone and octinoxate because of their damaging effects to coral reefs and other marine wildlife. If you’re heading to either of those areas, be sure your sunscreen doesn’t have one or both of those chemicals. A reef friendly sunscreen will protect you from sunburn and sun damage without causing more harm to ocean life. Our travel size sunscreen is perfect to clip onto your backpack or beach bag, and it doesn’t contain nanoparticles, which damages the entire ocean’s ecosystem. Grab a couple of these handy sizes so you’ll never be without sun protection on your trip. A spring break vacation is a wonderful way to escape the cold of winter and travel to a beautiful place for some R&R. 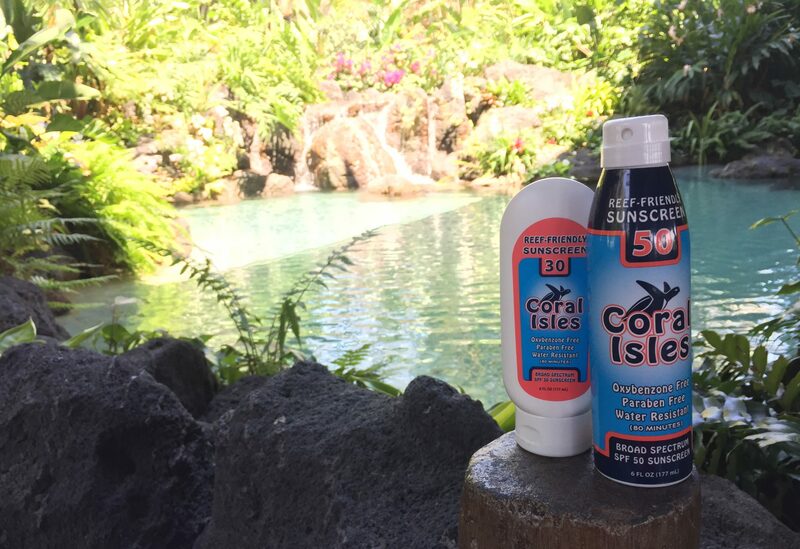 Don’t forget to pack your Coral Isles reef-friendly sunscreen! Our sunscreen won’t damage the coral reefs or harm ocean wildlife, making it the perfect choice to take with you on all of your adventures. Order yours today! Previous PostPrevious Is Sunscreen Safe for Babies?